Straight up VINs do nothing for us (we can't help you). *IF* you have a photo of the cowl build tag, then more info is possible. The only way to get more info is to contact Fiat Chrysler Historical services in Detroit. The issue is your photo is >250 kB, the forum max. Here is is resized. What are the numbers under "SCHED"? 2208? Location: So. California The only help that I can give you is that your car was built in Los Angeles. You can use the 508 trim code to get the right fabrics from SMS. Also, my '56 Savoy has the same M8=3, M9=8 on it that yours does. One of those is likely the 277 V8/automatic option since my car didn't come with many options like yours did. Hmm... Usually Sched = month/day like my LA built 56 Dodge is 0515, i.e May 15, 1956. Plymouth must be different. P29-3 = Belvedere (or Fury). Location: So. California Dave, that paint sheet tells you exactly what the 671 paint code is. 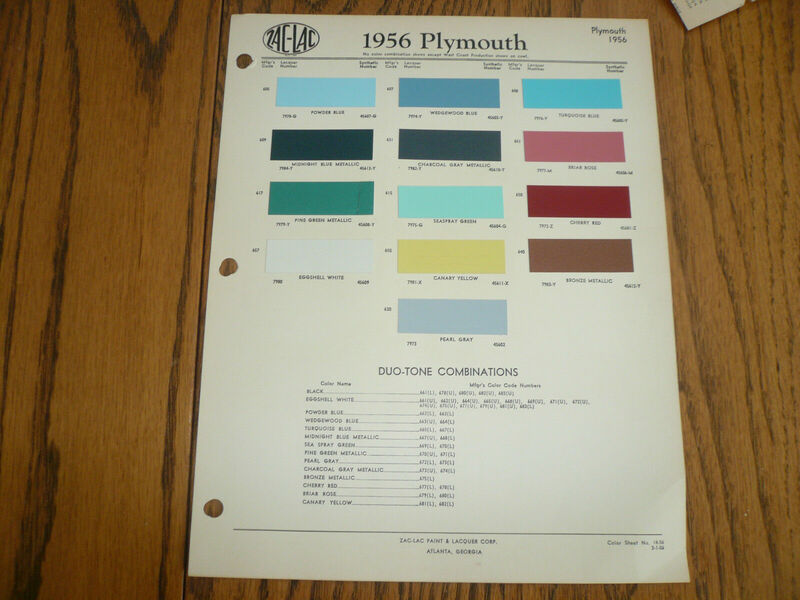 It corresponds to an Eggshell White upper color and Pine Green Metallic lower color for a 2-tone car. very helpful so far guys, thank you! Location: So. California Please list all the options that you know your car came with. That may help us figure out what all the LA codes stand for in the future. Right now, I only know it's a v8 auto car, AC, NO PS. I'm picking it up in a couple of weeks and doing some pre-research. You guys are correct, it is a white / pine green car as well.